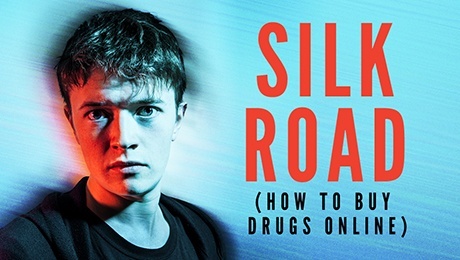 Shrapnel Theatre today announces the return of Alex Oates’ Silk Road (How to Buy Drugs Online), the first production to be funded through the cryptocurrency Bitcoin. Dominic Shaw directs Josh Barrow (Bruce Blakemore) at Trafalgar Studios, Tuesday 7 August to Saturday 1 September. Inspired by interviews with real online drug vendors, Alex Oates’ piece is about the freedoms and danger of an unrestricted Dark Web and its impact on a teenager finding his way in the world. Following a call-out on the real Silk Road forums for contributions to the original production’s crowd funding campaign, an anonymous donor donated two Bitcoin. Playwright Alex Oates reinvested the Bitcoin and through this funded runs at Edinburgh Festival Fringe, VAULT Festival and Live Theatre, Newcastle. Alex Oates has been shortlisted for The Old Vic 12 and Papatango Prize, and long listed for the Bruntwood Prize. His other theatre credits include Rules for Being a Man (UK tour), Pig (Hull Truck Theatre/New Diorama Theatre), Hansel (Edinburgh Festival Fringe/Hull Truck Theatre), People Will See Me and Cry (Arcola Theatre), Time Warner Ignite (Old Vic Tunnels); and for television, Match Not Found and EastEnders: E20. Josh Barrow returns to play Bruce Blakemore. He is a member of the National Youth Theatre with credits including Zigger Zagger (Wilton’s Music Hall) and has worked on the Royal Court Theatre’s Open Court Project 2016. He is also TriForce’s Monologue Slam National Champion 2017. Dominic Shaw directs. His other directing credits include Secret Garden (Barn Theatre), A Memory For Forgetting (Arcola Theatre), Get Got (Edinburgh Festival Fringe) and Thirteen Days (The Other Palace). As an Associate Director his credits includeKinky Boots (Adelphi Theatre),Beautiful – The Carole King Musical (Aldwych Theatre),Dirty Rotten Scoundrels (Savoy Theatre/UK tour) and Legally Blonde (Savoy Theatre/UK and international tour). As an actor his credits include Wicked (Apollo Victoria) and Hairspray(Shaftesbury Theatre).